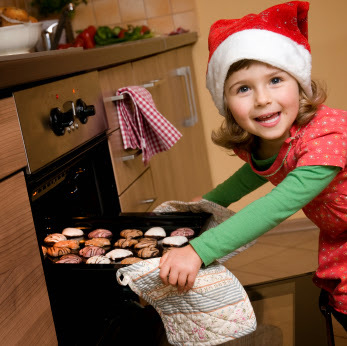 5 Reasons to bake with your kids during the holidays. What will your kids remember most about Christmas when they're grown? Do you want to give them meaningful memories that have nothing to do with gifts? Give them time spent with you. A fun way to spend time together is in the kitchen baking. 1. Baking fosters independence. School aged kids like to imagine what it will be like to be grown up. Naturally, the older they get, the more independence they want. The kitchen is the perfect place to let them spread their wings. In the kitchen, they can learn adult skills. By teaching your kids to cook and bake, the door to freedom and responsibility opens a bit. Even at school age, your kids can master the art of baking and fixing other food. Yet, finding time to teach them when they're in school can be hard for busy parents. Now's your chance! Why not take advantage of your kids' vacation from school and get baking! 2. Baking allows a sense of satisfaction and pride. When your kids make a plate of tasty Christmas cookies the whole family can enjoy, they experience a sense of accomplishment. They get to feel the satisfaction of being praised for their hard work. 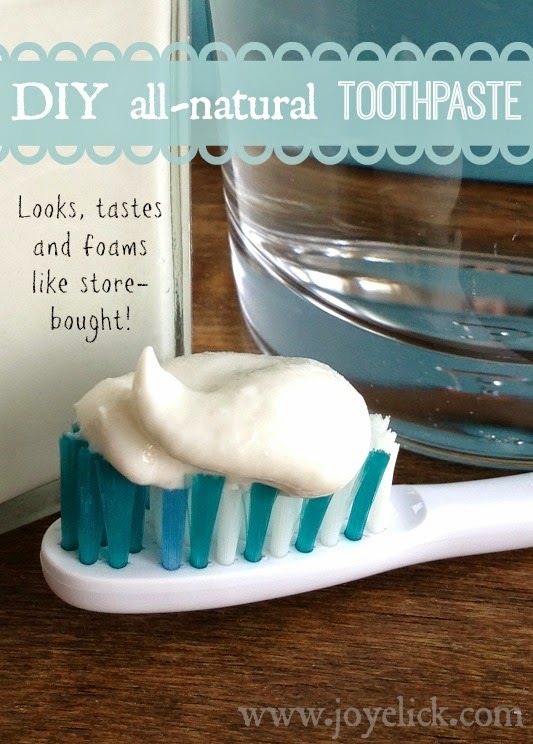 Even if what they make doesn't look perfect, it probably still tastes delicious and will bring them praise that can boost their self-esteem. 3. Baking can become a favorite holiday tradition. Kids enjoy traditions. The neat thing about holiday baking, is you bake things you usually don't the rest of the year. These treats become associated with the holidays. 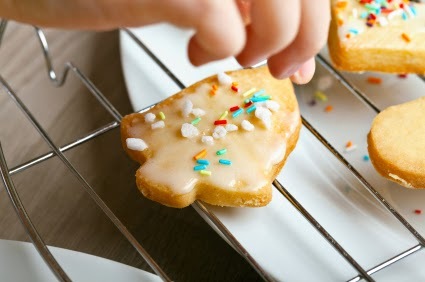 By providing traditional fun activities, such as baking, you give your kids more reasons to look forward to the holidays than simply the gifts they'll receive. 4. Baking can encourage generosity. Let your kids fill a gift-box with those chocolate button cookies they made and give it to Grandpa for Christmas. Kids need experiences like this. Sure we like giving our kids gifts, but we also want them to know there's more to Christmas than getting presents. Giving is fun too. 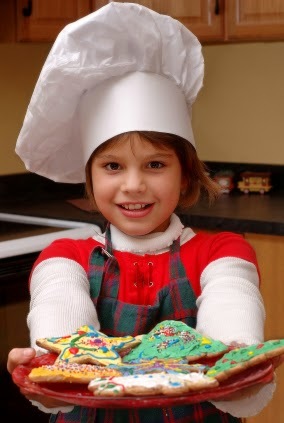 Turning their baking fun into a gift-giving opportunity encourages your kids to think of the giving side of holiday fun. And best of all, when they give a gift they made themselves, they connect that much more with the pleasure of giving. 5. Baking can be an amazing memory-making experience. When I was a kid, Grammy included my twin sister and me in her holiday baking each year. We loved hanging out with her in the kitchen decorating sugar cookies and making taffy. Sure there were presents at Christmas, but years later, what do I remember most? The time I spent with Grammy. One reason holiday baking makes lasting memories is it involves all the senses, especially smell. When I walk into a room and smell gingerbread, can you guess what I think of? They say you remember smells more than you do images or sounds. 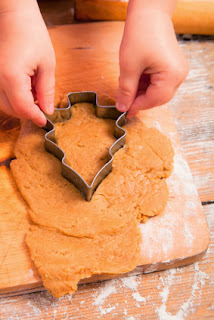 Give your kids baking memories and they'll remember them! 5 Tips for baking with kids. 1. Choose a recipe you're familiar with. Before having the kids join you in the kitchen, take time to read through the recipe. Pull out everything you'll need, including bowls, utensils, mixer, etc. There's nothing worse than have sticky goopy hands then having to go rummage through a drawer for something. 2. As you read through the recipe, think about what prep work might make good side jobs so everyone will have a job to do. For example, someone might butter the cake pan and cut parchment paper, while another runs the mixer. Keeping everyone busy is one key to controlling chaos. 3. Avoid the chaos of a cluster by doing the project at the dining table. Providing each kid with the subtle personal boundary of a chair can do wonders in promoting order. 4. Lower your expectations. It doesn't have to be perfect. 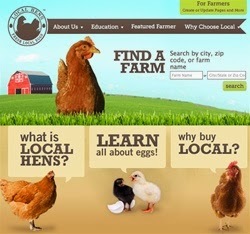 Baking with kids is a good time to remember the farmgirl principle that the process counts just as much as the product. 5. Be safe. One thing you should never do is let your kids use a stool at the stove. If they aren't tall enough to reach the stove-top without a stool, give them another job. It's just too risky. Losing their balance could lead to a bad burn. It may seem like extra work, but baking with your kids can be rewarding to you as well as them. What baking memories to you have? What will you bake with your kids this year? I'd love to hear from you in the comments below.